Knoxville, Tennessee – 6:00pm. Starts in Market Square and we’ll march to Vine Middle School on MLK Blvd and end at Harriet Tubman Park for a BBQ and celebration! Hosted by the Put the People First Coalition. Contact Jared Story, United Campus Workers (CWA) at jaredtstory@gmail.com or 423-794-8629. Charleston, South Carolina – time TBA. Panel discussion held at the International Longshoremen’s Association Local 1422 union hall, 1142 Morrison Drive. Contact Leonard Riley at 843-830-4471 for more information. Other actions TBA in Chattanooga, Memphis and elsewhere. May Day was born over 120 years ago commemorating the Haymarket Massacre in Chicago in 1886 when police shot workers who were striking to establish the eight-hour workday and the right to organize and prohibit child labor. The US-South revived and regenerated Mayday commemorations during the 2006 general strike, which was fueled by migrants. The US South unites youth, women, men, immigrants, Indigenous Peoples, labor unions, LGBTQ, human rights organizations, farm workers, environmentalists, workers and social movements with the rest of the US and the world to Decolonize and Regenerate our struggles to propel ourselves forward for Liberation in the 21st century and to do away with Borders, Respect Human Rights, and for Universal Rights for all workers of the planet and our right to migrate anywhere on earth. The South forms and represents working class struggles. The South demands Universal Living Wages, the Universal Right to organize and Universal Migrant Rights. The South demands the criminal charges against all Moral Monday arrestees be dropped including Saladin Mohammed Leader of Southern Workers Assembly in Raleigh, North Carolina. The South forms part of a social movement that denounces the neo liberal politics of government and its political parties. President Obama promotes imperialist wars in Afghanistan and other parts of the world to steal natural resources. We say End US-EU-NATO wars in the Middle East and Africa. US hands off Venezuela and Ukraine, no more wars for natural resources. The South demands stop the war and bring the troops home. The South denounces the economic crisis of the capitalist system that was forced onto the people by the super rich, transnational corporations and the banks that the people bailed out only to make the rich more rich and the poor more poor. The crisis of mass unemployment continues as over 30 million workers remain unemployed and over 20% of those employed remain underemployed, the vast majority in low-wage, dead end jobs. Unemployment for Black, Brown and Native workers is more than double that of white workers. We demand a Federally-funded public works jobs program and full employment now! The South denounces the failure of the neo liberal model of the free trade agreements like Nafta, Cafta and the current Trans Pacific Partnership which President Obama wants to fast track. This agreement will set new rules on food safety and medicine prices. The free trade agreements exploit workers and displace communities over Mexico, Central and South America and the world with poverty wages, without the right to organize unions, bad working and social conditions. The South denounces and demands the abolishment of the “Taft Hartley Act” and section 14B that prohibits the right of workers to organize unions, collective bargaining and the right to strike. We demand comprehensive labor change. The South denounces the militarization of the US/Mexico Border that is racist and criminalizes immigrants takes them to their death, provokes division and violence among communities along the US Mexico Border. The South denounces raids and deportation that divides immigrant families and treats them as if they were terrorists. We denounce the ICE commandos and the mistreatment of immigrant families. We demand laws that recognize basic rights for all immigrants, social services and immigration laws that recognize the principal of universal citizenship. The South denounces the attack on Public Schools by conservative right wing politicians, which has caused loss of jobs, a loss of billions of dollars and a second class education due to privatization of education throughout the south. The South denounces the increased New Jim Crow activities and white supremacy and racist laws such as the stand your ground law which has resulted in the death of young Black people such as Trayvon Martin and Jordan Davis and other people of color and indigenous people. We demand an end to police terror, police murders, brutality, racial profiling and the school-to-prison pipeline. We demand a decolonization process to end death and violence. The South commits to supports efforts of youth in their forms of expression and commit to be at their service in the initiatives of the right to education and their right to form and create organizations. The South commits to look for and implement alternatives of ALBA (Alternative Bolivariana de las Americas) towards globalization, war, capitalism, neoliberalism and the inequality between poor and rich. The South commits to liberate all political prisoners including Mumia Abu-Jamal, Leonard Peltier, Imam Jamil Al-Amin and others jailed for activism, and those in Puerto Rico in their struggle for independence and discontinue being a colony of the US. We demand an end to the Cuban Economic Blockade and the liberation of the Cuban heroes prisoners in US jails. 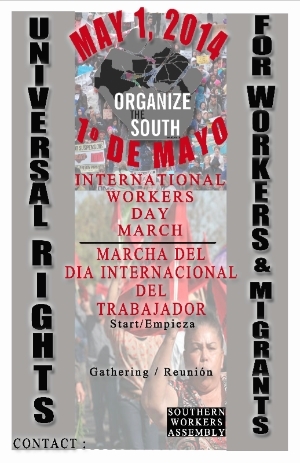 The South commits to organize and participate this May 1, 2014. With everything that we do, with everything that we are, with everything that we dream we have the security and faith of constructing a better world for all and all the human races. Another South, Another US and Another World is Possible! ** SUBMIT YOUR ACTION ! !